Readers of this website are already familiar with my enthusiasm for coconut oil. Now, there is even another reason to love it. When used in a certain way, coconut oil can make a bowl of white rice into a much healthier meal. In fact, this unique cooking method means that your body will be able to absorb half of the calories in rice with the added benefit of decreasing body fat accumulation. It’s true that white rice is a highly processed grain and has a high glycemic index. But, the effect food has on your blood sugar can be altered depending on what you eat it with. Researchers from Sri Lanka might have uncovered a Holy Grail of rice cooking that could shake the way we view and prepare rice. They presented their preliminary findings at the National Meeting and Exposition of the American Chemical Society. Authors of the research, Sudhair James and Dr. Pushparajah Thavarajah, tested 8 different recipes on 38 varieties of rice. 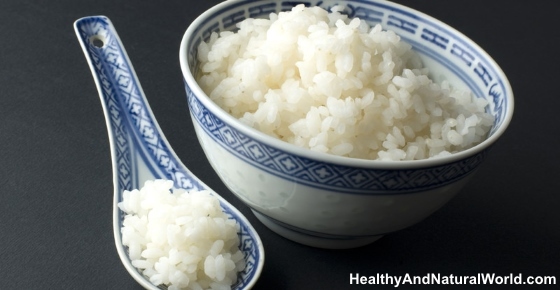 The cooking method that proved to be the best at increasing the rice’s healthiness included adding coconut oil to boiling water, before stirring in raw rice. The rice was then cooled down in the refrigerator and consumed after 12 hours. When the least healthy of all rice types was prepared in such way, its calories were reduced by 10 to 12 percent. The two scientists, conducting their research at the College of Chemical Sciences in Colombo, claim that further caloric reduction is possible. They predict that if the right variety of rice is prepared with coconut oil, the calories could be cut by about 50 to 60 percent. Related post: How to use coconut oil for weight loss. Why does this Cooking Method Cut the Calories? Intuitively, many cultures prepare food in a way to make it healthier. Some schools of nutrition, too, have believed all along that mixing certain fats with food rich in carbohydrates (such as rice) could lower the meal’s blood sugar raising effect. One cup of medium grain white rice usually contains about 246 calories. With this method, the calorie count goes down to as little as 147. What’s more, resistant starch is considered a prebiotic and compliments the function of probiotic foods (read more in my article about 9 reasons to consume probiotics). It feeds the good bacteria in your gut and aids your immunity and digestive processes. Stir in 1 cup of rice. Cook for about 20 minutes, until the rice is cooked. Put in the fridge for 12 hours. Use cold or re-heat it – according to the Sri Lankan research, the rice maintains its newly acquired benefits even after heating it again. The white rice might become healthier when the above method is applied. Still, you shouldn’t now eat it in unlimited amounts. Also, consider using brown rice instead. Brown rice doesn’t have the germ and bran removed, so it’s a better option as it retains the bulk of its vitamins, minerals, essential fats and fiber. You can also try consuming purple rice which has many health benefits and is cooked the same as brown rice. How about added Ghee to Basmati Rice or Coconut Milk Rice is it healthy? The research was done with coconut oil, so I don’t know what the results are with the other ingredients and whether the calories could be cut by about 50 to 60 percent like with coconut oil. Generally speaking, consuming ghee and coconut milk in moderation and as part of a healthy and balanced diet is fine. I have read about resistant starch for pasta also, no mention of coconut oil, just refrigeration. Is the oil really needed then? I’m not sure, I couldn’t find information about it. what about brown rice? does this method work for brown rice as well? The study was done on white rice and not brown rice because white rice is high in starch, which converts to sugars that your body uses for energy but can turn to fat if you don’t burn it off. White rice consists of two different starches, digestible starch and resistant starch, which takes a long time to digest and isn’t converted into simple sugars. In the study, adding the coconut oil increased the amount of resistant starches and thus reduced the amount of calories in white rice. IS THE WHOLE IDEA DEFEATED IF THE RICE IS NOT REFRIGDERATED? Your response is appreciated. I think so…whether using potatoes, pasta or rice, chilling after cooking seems to always be part of the formula…. I’ve already heard/read this before and this was very troublesome. Like here in ou country, no one will eat a cold or reheated rice. Rice is best eaten at fresh cooked, if you want healthier rice then better get a different one. Refrigerating rice overnight will reduce caloric index by 100% in our home as nobody will eat it! I wonder what non-virgin coconut oil comes from. Maybe I shouldn’t think about that. I don’t think cooking white rice differently is wrong, but then I’m critical of using saturated oils in any food. Does it mean its wrong to parboil before cooking? This is a great nutritional discovery. Especially if you’re into eating fried rice. One simple step and your caloric intake is now halved,at least as far as the rice is concerned. Just think of the benefit if you start with a less starchy alternative than white rice.